Blinds Venetian offer a versatile and stylish way for varying the amount of light coming into a room. Available in ready made or made to measure, we offer a wide variety of accessories too. We have emerged as a leading manufacturer of superior quality of Blinds Venetian that include an array of beautiful and exquisite colours to match any room. They are exclusively designed to our high standards and provide premium looks and marvellous quality and we offer them to our customers at competitive prices. Our online shop is safe and totally secure using only the most up to date billing transactions. Our philosophy is clear, we at Nets2Go.co.uk are proud to be considered one of the best online curtain and blind shops in the United Kingdom, with a solid reputation for quality of products and service, fairness and integrity. If you want to relish a new challenge with an opportunity to redecorate, then create a contemporary and romantic bedroom with trendy and classic looking window dressings then order your blinds from us. You can choose from subtle, contemporary and wonderful pale colours like Lilly or Peach, Vanilla or Apricot to Silver and Lavender and bring the same accents throughout the room, by matching with formal wall colours and pretty coloured furnishings, until your style is achieved. The Blinds Venetian we manufacture are recognized for their high fashion value, trendy and our classic designs are made to last. These Venetian and our new flame retardant blinds are flawlessly tailored using highly refined top of the line fabrics that exude elegance with modern fashion tastes. A stunning contemporary blind brings great flexibility, because it filters the light that suits your mood, just by moving the slats. It's so simple and very easy to install giving you as much privacy as you want. See our online catalogue for your taste in colour palettes ranging from the beautiful Terracotta, Teal, Ecru, Lilac or naturals and start the process to create that ultra modern look for your windows. The beauty of Venetian blinds lies in their simplicity, they are not only ideal for sunlight, but totally uncluttered and the perfect solution for tilt. 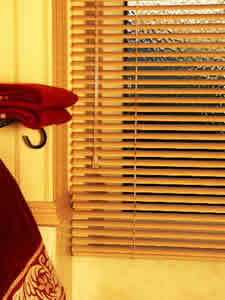 Venetian blinds inside a window recess can be classed as a very functional item too, perhaps during the hotter months as a sun-screen during the day, with an added pair of beautiful curtains for the evening, not only for added privacy, but for that perfect look for your window. 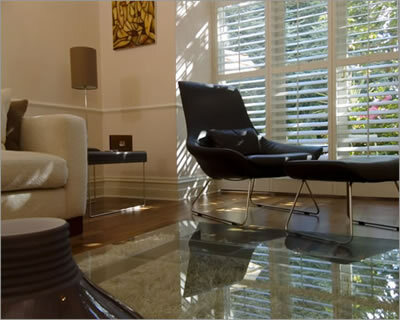 Strong, durable and affordable we supply only the best, Blinds Venetian are our speciality.